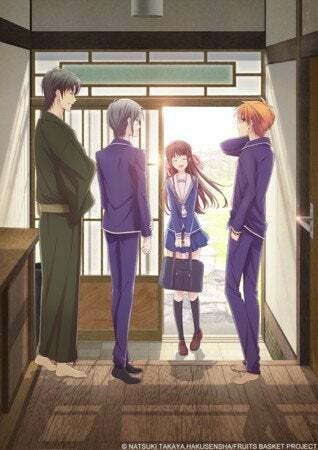 On the pages of the newest issue of Kadokawa´s Monthly Newtype magazine it has been revealed that the anime of Fruit Basket is coming this april. Due to one of the author´s request, the anime will have a complete new staff and cast. “After the accident in which she lost her mother, 16-year-old Tooru moves in with her grandfather, but due to his home being renovated, is unable to continue living with him. Claiming she will find someone to stay with but also fearing the criticism of her family and not wanting to burden any of her friends, Tooru resorts to secretly living on her own in a tent in the woods. Yoshihide Ibata (FLCL Progressive) is directing the anime at TMS Entertainment; Taku Kishimoto (Hanebad!) is in charge of series composition.